The Nolan Rhodes, from the John Bludworth yard, on the job for Enterprise Marine Services near Channelview Texas. Enterprise Marine Services, a subsidiary of Enterprise Products Partners L.P., is making a major commitment to Z-Drives for the US inland waterways. 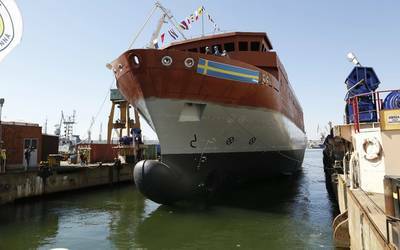 They currently have four Z-Drive boats in service and have taken delivery of two new Z-Drive vessels from Sneed Shipbuilding in Texas with three more under construction. 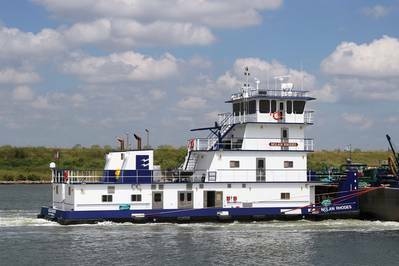 The new vessels, named Sheridan A and Terry H, were built by Sneed Shipbuilding, Inc., Channelview, TX. They measure 87 x 34 x 11.5 ft. and have a 34.8-in. eye level. They are powered with a pair of 1,000 hp. Cummins QSK 38M, Tier III, diesels coupled to Z-Drives from ZF Marine. A pair of 85 kW, Cummins QSB7 generators meets the electrical needs for the towboats. Tankage of these boats include: 30,000 gallons for fuel, 16,000 gallons for water and 500 gallons for lube oil. They are the first two of five similar boats being built for Enterprise by Sneed. Meantime, the John Bludworth Shipyard of Corpus Christi, Texas has already delivered the Freedom, Valor, the Jeris Authement and the MV Nolan Rhodes to Enterprise Marine Services. These boats, designed by John L. Bludworth, III, are slightly different from the Sneed boats, measuring 86 x 34 x 11 ft. with a 34-ft. eye level wheelhouse view. A pair of Cummins 1,000 hp, K38-M II Tier III compliant diesels powered the first two boats and the last two were equipped with the QSK 38M, Tier III’s. All of the vessels have identical ZF AT 5111 WM-FP, 1,000 bhp, ZF Marine Z-drives with 4.824:1 reduction gears. The drives are fitted with 65-in. (diameter) x 55-in. (pitch propellers mounted in Kort nozzles.) 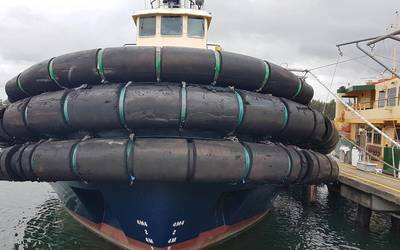 All of the new Enterprise Z-Drive boats will be tasked to push double-hulled 30,000 -barrel tank barges on the Inland Waterways and the Mississippi River. Additional equipment on all vessels includes two 40-ton Patterson deck winches, two Quincy 325 air compressors and full width fleet decks forward of the main deck house.